Designed for experiments where a large single stage is dictated, the MT-78 or MT-78-FS large-stage platforms provide solid, stable support and ample space to attach manipulators and other instruments as needed. The rigid aluminum top plate sits firmly on two of our well-known MT-75 gantry-style stands. These stands provide height adjustment and sturdy attachment to the user’s vibration table. Multiple degrees of freedom accommodate a variety of microscope and instrument arrangements. 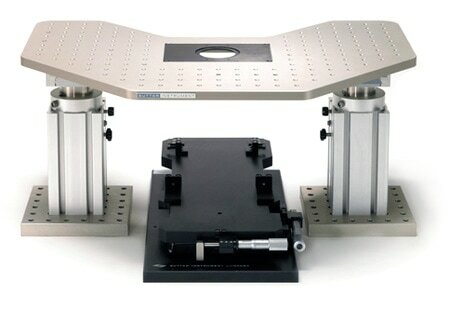 The MT-78 Large Moving Stage is available for patch slice or in vivo experiments where the microscope body cannot be moved to view different fields of view. This is most common in two-photon experiments where the excitation beam path must enter a fixed microscope. In order to visit wide-spaced fields of view, and potentially position pipettes at wide-spaced locations, the preparation and any associated manipulators must move together on a large stage. The MT-78 was introduced at the 2007 Imaging Structure and Function in the Nervous System at Cold Spring Harbor Labs. The stage was very well received. The MT-78 is also appropriate for use with inverted microscopes or other scopes that are larger and not easily translated. The MT-78-FS, Fixed Stage platform, paired with a Sutter Instrument XY translator (either the motorized MT-800 or manual MT-500), offers a large, single-platform solution for researchers performing experiments requiring X-Y translation of the optical pathway in order to view multiple locations within the specimen at high resolution. Many prefer a large stage design as it lends itself to the easy addition of manipulators, perfusion systems and other equipment to the setup. The cast aluminum top plate used in both the MT-78 and MT-78-FS has an attractive shape with an extensive 1/4-20 threaded hole pattern on 1-inch centers. This hole pattern is appropriate for mounting Sutter MP285 or MP225 manipulator mechanicals using the mounting adapter plates that come with these devices. Optional rotating bases (285RBI) are also compatible and add flexibility. Finally, the new, MP265/M mechanical can be mounted on its narrow linear slide. In the center of both the MT-78 and MT-78-FS top plates is a 4X6 inch milled pocket that will accommodate a variety of aluminum stage inserts, designed to secure various commercial tissue chambers or slide holders. Custom aluminum inserts can also be provided. An available magnetic stainless steel insert carries commercial chambers or can be provided with a simple large, through hole for mounting a custom chamber. The magnetic insert allows small magnetic devices (perfusion lines, ground electrodes, small manipulators) to be mounted easily near the dish.